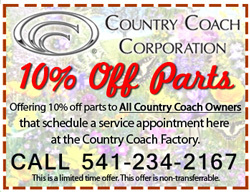 Country Coach Corporation offers a full service center with factory trained technicians, OEM parts and Factory Approved consignment sales coaches. Ron Lee, CEO and owner, was one of the original founders of Country Coach, who purchased the Country Coach Intellectual Property in 2010. Ron then launched Country Coach Corporation with a core team of highly skilled employees that together have over 400 year of Country Coach history, experience and tribal knowledge. These employees stand ready to help maintain and improve the investment in your Country Coach motor home with service, parts, sales and even apparel. Full Coach Service Center: The very best service for your Country Coach motor home will be provided by factory trained employees at the very factory where it was originally built. 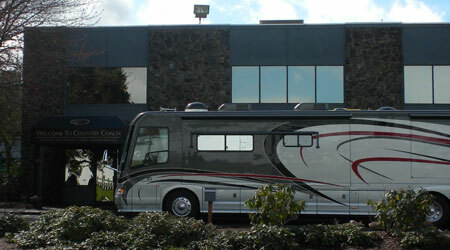 We specialize in CC motor homes but can service any model including Prevost buses. We offer complete coach services from oil changes to extensive remodels, full body paint and paint repairs, collision repair, and glass replacement. Our Dyno center is capable of complete chassis mechanical service, which includes 4-wheel laser alignment, brake testing and adjustment, engine and power train analysis. We have all of the original production fiberglass molds and tooling enabling us to fabricate new factory OEM parts, such as fiberglass bay doors, front and rear fiberglass caps, roof caps, interior dash parts, etc. We have engineering drawings to produce any part, including slide rooms and cabinets to their original equipment configuration. Country Coach Corporation can reproduce all original equipment parts such as fiberglass, cabinets, metal fabrication, and electrical, as well as, vacuumed formed parts. If you are looking to buy or sell…look to Country Coach Corporation! Our consignment coaches go through a multi-level inspection to ensure that they meet our high standard and are kept in our indoor showroom. Currently, the consignment sales department has a wide selection of coaches in our showroom and we are gearing up for the coming months. With financing now available, please allow our friendly and knowledgeable sales staff to assist you. Country Coach Logo apparel can also be found here at the Country Coach showroom in Junction City and on our website (www.countrycoach.com). We have a wonderful selection of CC logoed jackets, hats and shirts. You can also find logoed aftermarket items such as license plate frames, key fobs and coffee mugs. Check out all of the apparel shop offerings with new items being added all of the time. Ron Lee’s mission is to bring back the Country Coach brand along with a growing business back to the Junction City community. If you own a Country Coach, this is the place to come – the factory where your coach was originally built with technicians who have the knowledge and experience necessary. By using our services, you are guaranteeing our future. By guaranteeing our future, you are improving the value of your investment. Visit the Country Coach website at www.countrycoach.com, it has been up and running since early 2011 and is always evolving and improving. Country Coach has an online eMagazine called Country Coach Destinations®, which offers owners valuable technical advice, news about CCC, the owners’ clubs and much more. The latest edition can be found at destinations.countrycoach.com and on the website, www.countrycoach.com.